Kate air Rachel Scott her ABC news here in Warsaw holding. Vice president Mike pens hats a strong message for a one today and call about European leaders. The vice president said that over one does not change its behavior the regime could seek tougher sanctions from the United States. The vice president even to get one step further. Only helped European nations that have not apply want nuclear deal another troop administration withdrew from the nuclear deal. Today vice president called the deal disaster saying that it does not stop field line regime from acquiring power obtaining a nuclear weapon. Now the vice presidents here in Kuwait four S international summit aimed at solving some of its security concerns about rounding back around the Middle East. The United States partnered with Poland on this summit and some sixty countries attended. But elephant in the room a wine did not attend today's summit that I did not stop Iranian officials. I'm calling out the summit when a Lonnie official called it down on a rival. 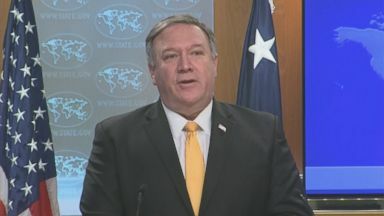 And said that the United States to come back to the negotiating table since they were the ones left in the first place. Now all of this looms as the country heads into another potential government shut down as we inch closer to that deal. Today I ask the vice president whether or not president tried it intends to sign the border and deal that's being present in. The vice president told me that he is weighing all options. Including. Looking at bad deal and evaluating. Evaluating it and also a value leading. His authority as the president of the United States which could hint at a possible. National emergency. For forty Warsaw Poland Rachel Scott ABC news. 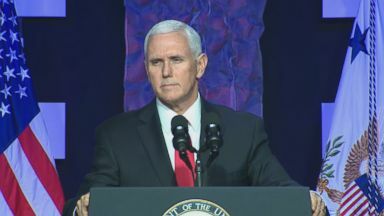 Vice President Mike Pence held a round table discussion with exiles from Venezuela in South Florida vowing to stand by the country.